Well, okay, that guy isn't a real person, but his phenomenally talented creator, Ashley Capes, sure is, and I will happily blame him for my addiction to his adventure fantasy series, The Book of Never. Today, the final book in this series, Imperial Towers, comes out and I cannot wait until my preorder copy hits my Kindle. Only one thing stands between Never and answers – his brother. Driven toward the enemy-occupied Imperial City, Never’s doubts grow. up responsible for the deaths of those he should have protected? In honor of this new release, and to show off the amazing cover art for this series, I've asked Ashley to tell us a little about this series, the artist, and why Never would be a good ally when the alien robots from space invade Earth. Read on to learn more! Christina McMullen: Imperial Towers is the last book in your Book of Never series and as happy as I am to read it, I’m sad to see the end. Tell us a little about the series. The series sometimes feels like Indiana Jones with more sarcasm and magic but there’s a clear epic fantasy setting. 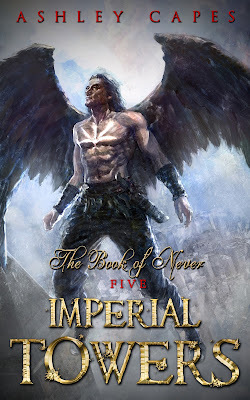 I wanted to write shorter, faster stories with this series and so I thought I could describe them as ‘epic fantasy without the epic length’ though Imperial Towers is novel rather than novella-length. Despite the comparative shortness, I still wanted to explore world-changing events. When I was planning the stories I tried to bring some memories to mind of rivalries or conflicts that had always inspired me, since I wanted conflict between brothers to be in the centre of this fantasy series. One that has always stuck with me was Astro and Atlas from Astro Boy. More recently I thought of Spike and Vicious in Cowboy Bebop. I loved that there was always the sense of much unsaid between those pairs of characters. CM: Now let’s talk about Never himself. Odd name, odd man, and one of my all-time favorite literary adventurers. How did you come up with your sarcastic and cheeky rogue? AC: Thanks!! I think he’s a bit of a natural progression from other characters I’ve tried in the past and the one which seems to work best. Part of his use of humour is a tool to keep distance between himself and others and part of it is more of an expression of frustration perhaps – he’s experienced enough set-backs that he knows he can either despair or laugh at the world. There’s a very bitter undercurrent to a lot of his humour and that’s really, really fun to write. When he’s being more gentle with his humour that’s pretty fun too. Most books that I re-read, I tend to re-read for character interactions. While the plot has fewer surprises, I tend to always enjoy the humour even though it’s not new either. For instance, I always enjoy the sarcasm and dialogue from Silk in David Eddings’ Belgariad. So Silk is probably a significant influence on Never. CM: Broken question time! Alien Robots have taken over the Earth. Everyone you know has been taken hostage. But, since the aliens broke reality, you can choose up to three of your characters to help you fix the world. Who do you choose and why? AC: Wow, tough (and cool) question! Hmmm... I’d have to take Never because he’s got quite a few tricks up his sleeve and wings are pretty handy, along with his ability to assimilate knowledge via his curse. I’d probably also bring Sofia from my Bone Mask Books since she has a great working relationship with the Greatmask Argeon, which is probably the most powerful object I’ve ever written about. More, as non-humans, the alien robots wouldn’t be able to forge a contract with Argeon if the mask was stolen. And finally Mia from one of my steampunk-influenced shorts (Esmeralda) since she has foresight and while it’s underdeveloped at present, rescuing hostages and saving the world will be easier if Mia can help me predict the future, even if it’s only a little bit. CM: Tell us about these covers. I absolutely love the artwork. I can’t choose a favorite, but I’m leaning toward the prequel just because it seems to sum up the character perfectly. Who did this art and how much input did you have vs artistic license? AC: Me too! I’m thrilled to have found Lin Hsiang’s work at Deviant Art a few years ago. And I feel the same, it’s hard to choose. I think I lean toward the prequel or maybe The Peaks of Autumn. Maybe! I had only a little bit of input really – I’d give Lin an idea of a general colour scheme, setting and a pose or an emotion then I did my best to get out of the way :) We’d often talk about initial sketches and the progress of each image but I definitely trusted Lin’s skills to deliver something ace each time. CM: Bonus broken question! Your last name is Capes. Have you ever considered writing about superheroes? It seems as if you were born for this! AC: It’s a missed opportunity, isn’t? I might have to in the future :D I need to figure out some sort of super power to write about first. I like the idea of doing an origin story for a superhero one day actually.